Save Yasuní, the Last Wonder of the Amazon! This petition has been created by Ivonne Y. and may not represent the views of the Avaaz community. In Ecuador thousands of us have taken to the streets to protest President Rafael Correa’s decision to drill in Yasuní-ITT. The area is the most biodiverse rainforest on the planet and the home to two of the last indigenous communities living in voluntary isolation. Drilling in Yasuní-ITT is a choice, not a necessity. If President Correa raised taxes on the 110 biggest businesses in Ecuador by 1.5%--which now pay a measly 2.9%--it would raise $20 billion, more than exploiting Yasuní-ITT. We supported a revolutionary plan to preserve Yasuní-ITT, and are gathering signatures for a national referendum that would reverse the decision to drill, but the government is trying to intimidate us. · Slow climate change by keeping400 million additional tons of CO2 underground. · Protect one of the last refuges of the American jaguar and millions of species of plants and animals. · Defend some of the world's last peoples living in voluntary isolation, the Tagaeri and the Taromenane. 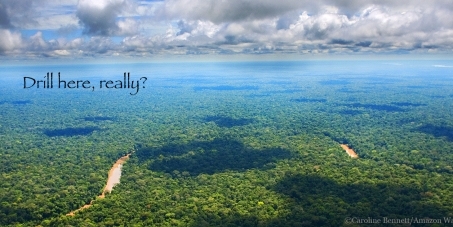 ·Stop us from repeating Texaco's (now Chevron's) legacy in the Ecuadorian Amazon. With Texaco’s arrival, two nomadic indigenous groups disappeared forever. Texaco contaminated much of the Ecuadorian Amazon and left an epidemic of cancer in its wake. Despite promises of best practices after Texaco left, from 2000 to 2010, there were 539 oil spills in Ecuador, nearly one per week.